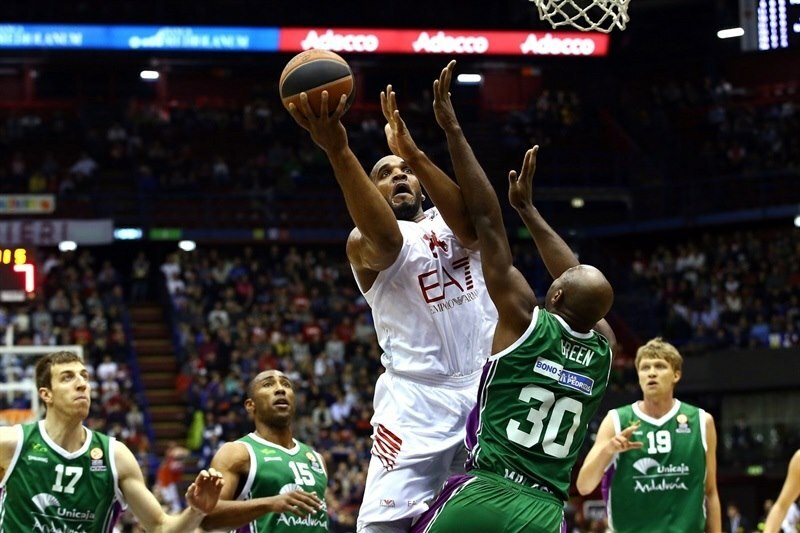 On a historic night in Milan, host EA7 Emporio Armani held off Unicaja Malaga 90-86 on Friday to register its first home victory in the Top 16 and thus keep alive its playoff hopes. 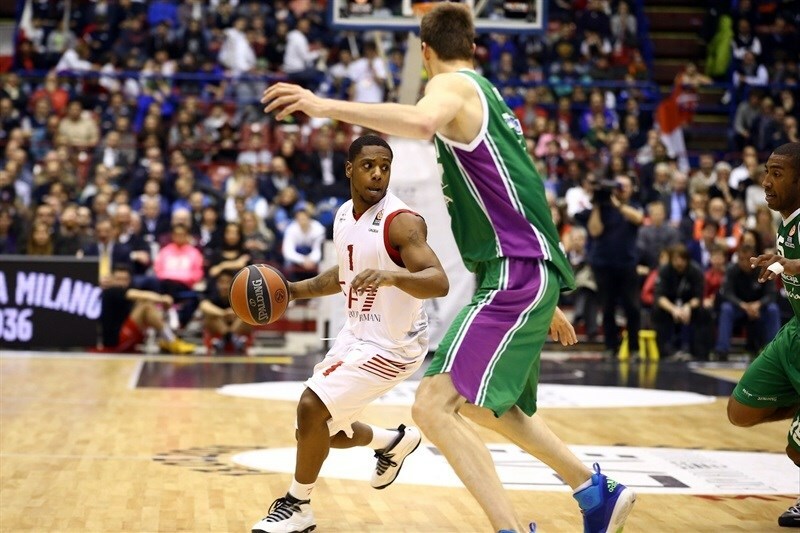 The win improved Milan to 3-7 and a share of sixth place in Group F, while Unicaja dropped to 2-8, alone in last place. 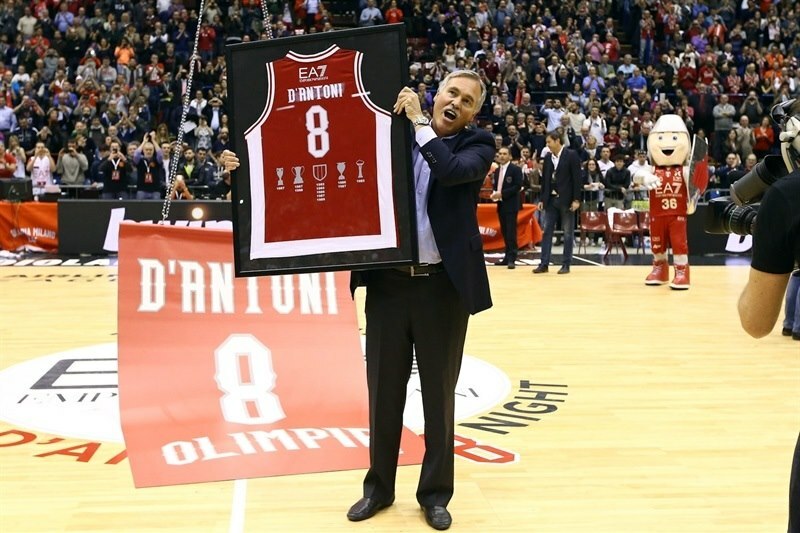 The contest started as a special night as Milan retired the number 8 of it's all-time leading scorer and former head coach, Mike D'Antoni, before a sellout crowd at Mediolanum Forum. 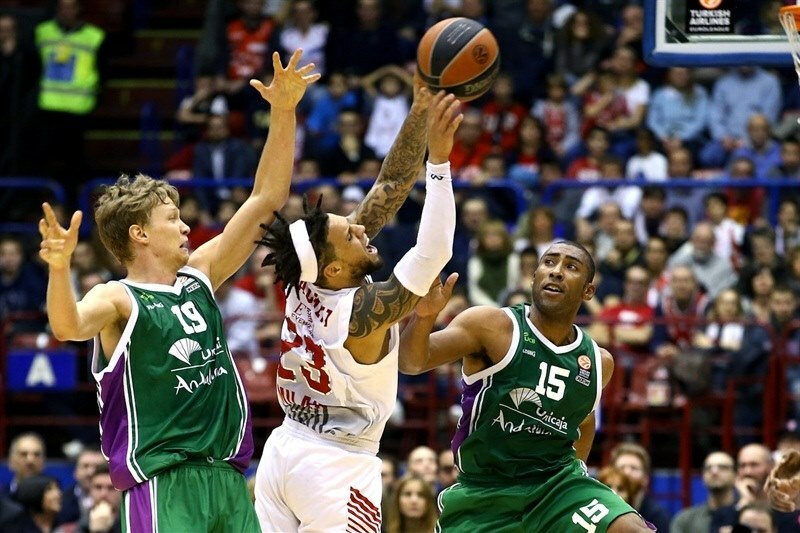 The game turned into a historic one, too, when Caleb Green hit a three-pointer early in the second quarter, marking the 500,000th point in the Turkish Airlines Euroleague history! 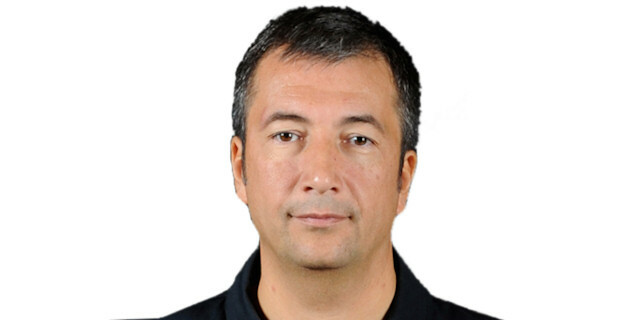 It also helped Unicaja build a seven-point lead, but Milan rallied after halftime when MarShon Brooks scored 14 of his 17 points, fueling a key 11-0 run that gave put the hosts ahead for good at 54-47. The margin topped out at 77-64 in the fourth quarter before Milan held off the visitors as Alessandro Gentile led the winners with 23 points. 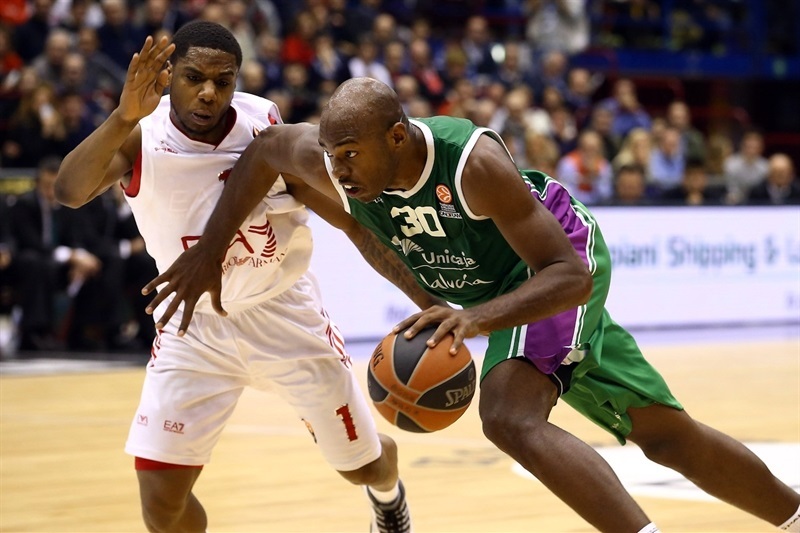 Samardo Samuels had 19 points plus 7 rebounds, while Green scored career-high 22 points for Unicaja. Daniel Hackett opened the scoring with a driving layup after a couple of offensive rebounds, then Samuels picked up a loose ball and scored to make it 4-0 for Milan. Unicaja countered with Stefan Markovic and Ryan Toolson nailing back-to-back triples, both from the left corner, for the visitors' first lead, but Nicolo Melli had a dunk and David Moss banked in a floater-plus-free throw to put Milan back in charge, 9-6. Toolson scored a baseline jumper and Vladimir Golubovic a layup for Unicaja to regain the lead. A layup from Will Thomas made it 9-12. After a timeout, Gentile had an easy layup, but Toolson knocked down a long jumper at 11-16. 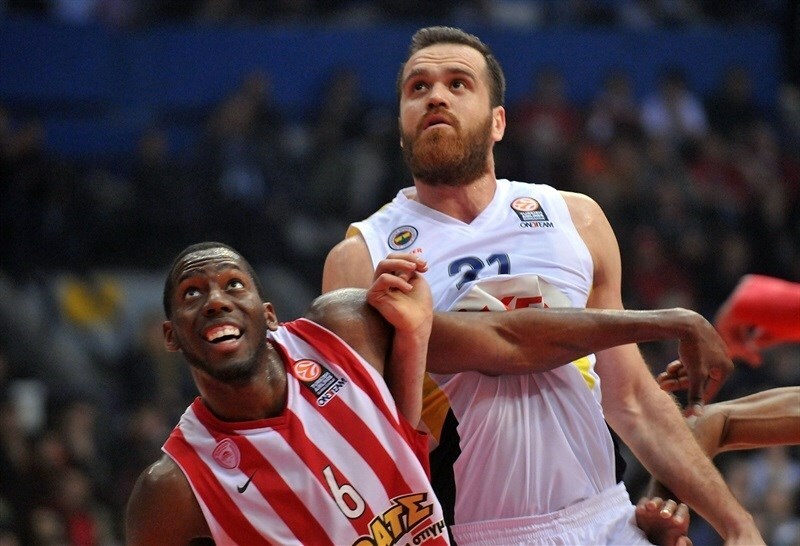 Melli answered with a triple for the hosts, but Mindaugas Kuzminskas hit his own from downtown at the other end. Gentile added a runner for Milan, and Samuels tied the score at 19-19 with a three-point play. Samuels finished a fastbreak with a layup for a brief Milan lead, but Jayson Granger buried a last-second triple to give Unicaja 21-22 after 10 minutes. Markovic started the second quarter with a fastbreak layup, but Joe Ragland answered by driving the baseline for a Milan basket. Linas Kleiza buried a triple for to put the hosts up 26-25, but Green answered back, scoring his three-pointer for the history books, marking the 500,000th point in the Turkish Airlines Euroleague history! 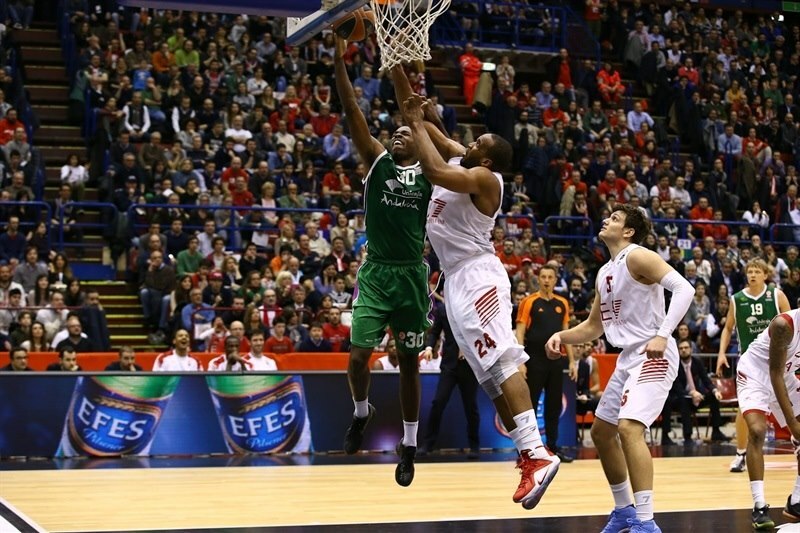 Green followed his historic basket with a fastbreak dunk and a 26-30 Unicaja edge. A mid-range jumper from Fran Vazquez opened up a seven-point margin, before Frank Elegar's alley-oop dunk snapped a 0-8 Unicaja run. Granger raced for an uncontested fastbreak layup, but Brooks drove for a layup-plus-free throw and Elegar threw down another alley-oop dunk at 33-35. Vazquez knocked down a long jumper, keeping Unicaja in front, but Gentile drove to the hoop and followed it with a corner triple at 38-39. Samuels then dunked to cap a 7-0 run that have Milan a lead, but Golubovic responded with a jump-hook in the lane, and Toolson scored an easy fastbreak layup, 40-43. 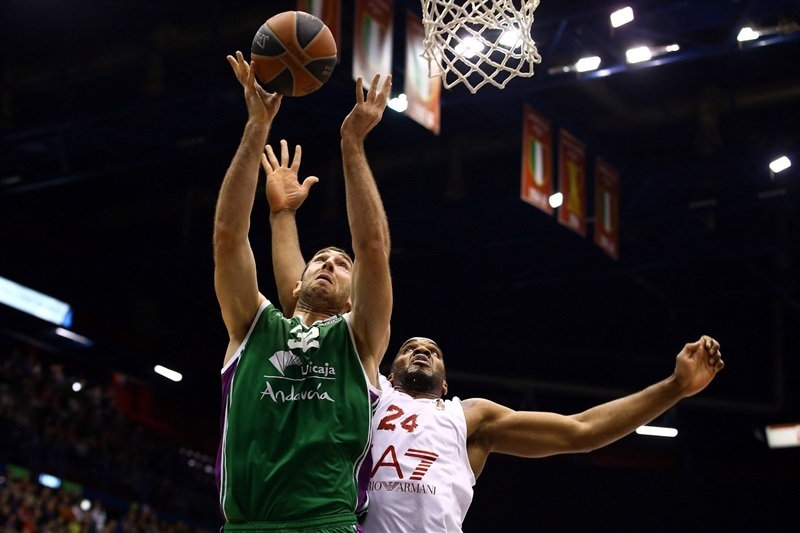 Gentile tied it with a three-pointer, but Unicaja went into halftime with a 43-45 lead after Golubovic free throws. 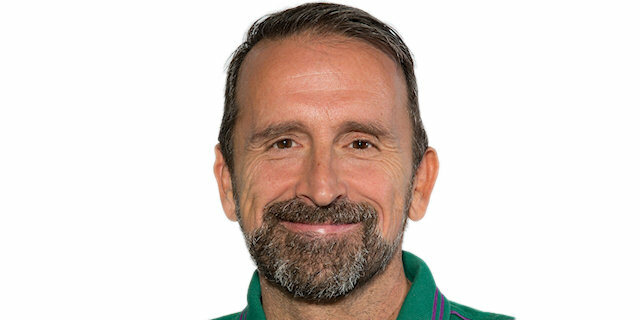 Thomas scored a put-back at the beginning of the third quarter to extend Unicaja's advantage, but right away, Brooks answered with back-to-back triples from the corner to put Milan back in front. Samuels followed with a long jumper, and Brooks hit another three to suddenly give Milan a 54-47 advantage. After a timeout, Carlos Suarez snapped Milan's 11-0 run with a jumper, but Hackett hit a jumper of his own for Milan then drove for a layup to make it 58-49. 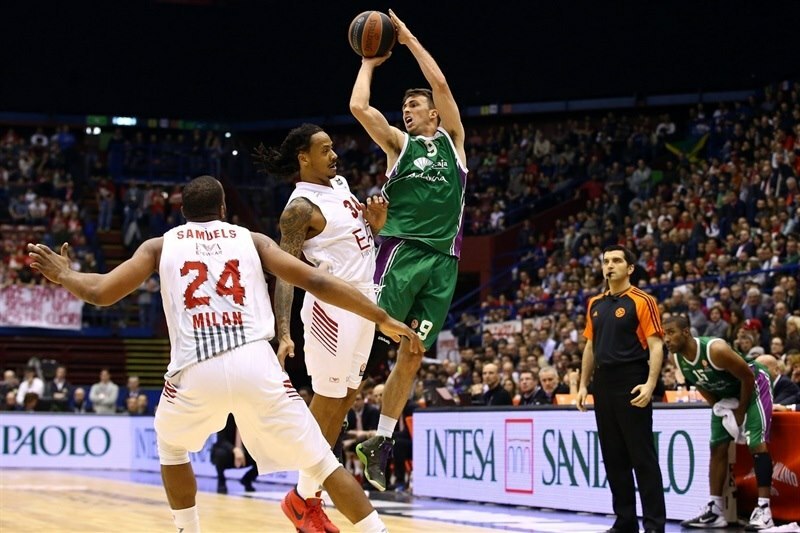 Suarez finished Unicaja's fastbreak with a layup, and Granger drove the lane for an easy two, forcing Milan timeout at 58-53. After talking it over, Gentile scored from close range for Milan while Brooks nailed a triple and a fastbreak layup for the first double-digit margin of the night, 65-55. Green's layup was cancelled out with free throws from Samuels, but Green had another layup in the final minute, cutting Unicaja's deficit to 67-60 after three quarters. Gentile and Granger traded baskets to start of the fourth quarter, then Green hit a fadeaway jumper to close the gap to 69-64. But that's when Melli knocked down a three-pointer, Gentile drove for a runner, and Samuels capped a 7-0 run with a put-back-plus-free throw for a new high lead of 77-64. Green kept Unicaja in it, burying a three, and the visitors used an unsportsmanlike foul from Kleiza to close within 77-72 on a Kuzminskas triple. 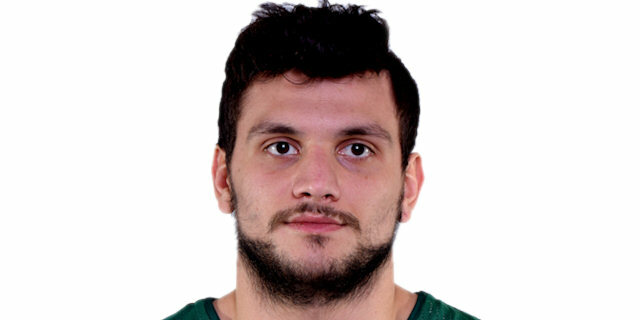 Gentile replied with a three-pointer to keep Milan safe. 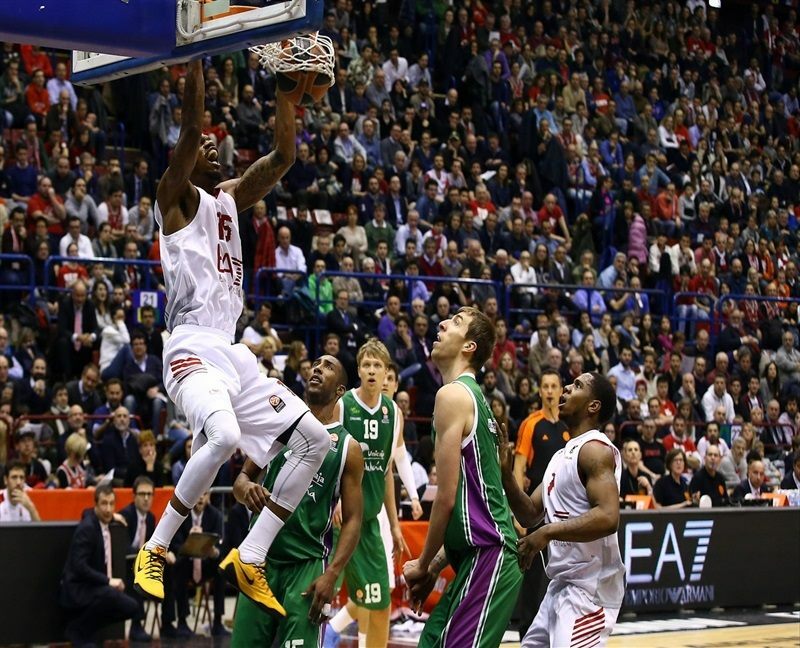 and after 2 of 3 from free throws made by Green, a dunk by Samuels gave put Milan in front 82-74. 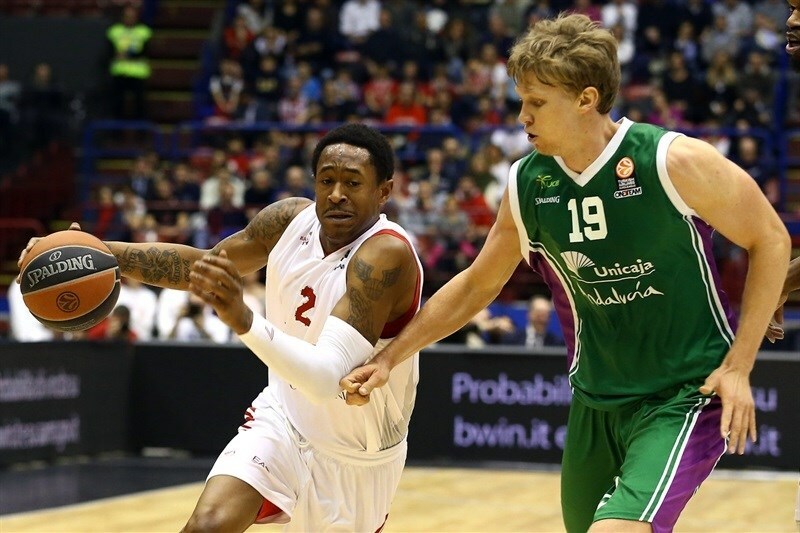 Green split free throws and Kuzminskas fought for a tip-in to make it a five-point game, 82-77. After an offensive unsportsmanlike foul by Samuels, German Gabriel hit 1 of 2 foul shots, before Hackett hit a baseline jumper at 84-78. After a timeout, Toolson nailed a three-pointer, cutting the distancce to 3 points, 84-81. After Samuels split free throws, Green scored a tough layup that dropped the difference to 85-83. In the final 45 seconds, Hackett only split free throws, but Milan secured an offensive rebound, and then he scored an easy layup off Gentile's inbound pass at 88-83. Toolson answered with another tough triple, but Milan kept the ball away until only 5.2 second were left on the clock. Gentile sank both free throws, sealing the deal. "It was an important win. It is a mental part of our job. Guys are doing an excellent job with a big effort. Everybody was very frustrated because losing four home games in a row in the Top 16 is a lot. Tonight was a more than a simple game. It is a good win, and I hope it can give everybody the confidence to continue this way." "What we see watching the stats is that we won three quarters but lost one. It is true that when a game is a close game, both teams deserved to win. We did a pretty bad job on defense and rebounds tonight. We managed to return to the game with good defense, but in the fourth quarter, we made some bad decisions in crucial moments, which allowed them to get a good enough lead in the final minutes and win the game. In any case, I am happy with our attitude. We were without two important players, Kostas Vasileiadis and Jon Stefansson, but the team never gave up and kept fighting no matter what. We are growing as a team." "We lost all games at home in the Top 16, so we wanted to win in front of our crowd. So, the win was very important." Mike D'Antoni shows his own shirt. #8 will be retired by AE7 Olimpia Milan in honor of his ex-player.